There's live music at 16 clubs and restaurants tonight, and a free trolley to take you from one to the next and the next after that. You can hear singers, straight-ahead jazz, piano jazz, salsa with soul, some blues and roots, improvisation, and the Great American Songbook. You can take your beer on the trolley. Are you in New Orleans? New York? Surely not St. Paul, Minnesota. When the Twin Cities Jazz Festival moved this year from mostly Minneapolis to exclusively St. Paul, it brought along one of my favorite parts: the Jazz Night Out that opens the festival. Buy a button for $15, ride around free from 8:30 pm to 12:30 am, get in free everywhere, save a buck on beer and rail drinks. A fun way to spend a summer evening. We have dinner at the Bulldog, then go to the Camp Bar for the Jazz Vocalists of Minnesota show (where we hear Gregg Marquardt, Tommy Bruce, Connie Dusseau, and Lucia Newell...Lucia, will you please record some of those Betty Carter songs? Arne and Nancy, will you forgive us for leaving before you sang?). From there to the Black Dog (via a circuitous trolley route) for the Fantastic Merlins with Nathan Hanson, Brian Roessler, and Pete Hennig. From there to Rumours & Innuendo for Framework with Chris Olson, Chris Bates, and Jay Epstein. Dance music thumps up from downstairs. Olson plays his iPod guitar. We drink more beer. From there (for some of us) to the Artists' Quarter for a rare appearance by The Five with Kenny Horst, Dave Karr, Steve Kenny, Tom Lewis, and Mikkel Romstad. HH and I head home so I can be relatively bright-eyed for my 8:30 am Friday radio date with Ed Jones, which turns out to be an 8:10 am date--good thing I get up early and check my email. 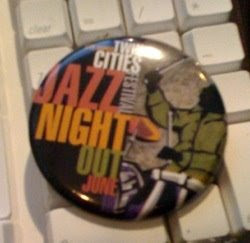 The Jazz Festival continues through Saturday night. It looks like a good weekend for live music in Mears Park. Photos: The $15 button. 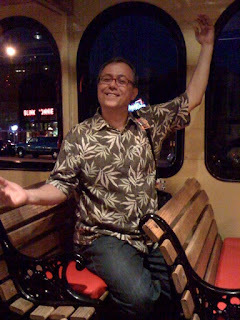 Jazz Police Chief Don Berryman on the trolley but not, as he noted, on the wagon.